With 1,300 vehicles set to sell at this week's Barrett-Jackson Collector Car Auction in Scottsdale, Ariz., the managed mania of collectable cars will hit its annual high. Thanks to a growing number of million-dollar models and a penchant for publicity, Barrett-Jackson draws more gawkers than any other such event. Thanks to its open doors for any seller willing to forgo an auction reserve, it also offers a welter of weirdos. 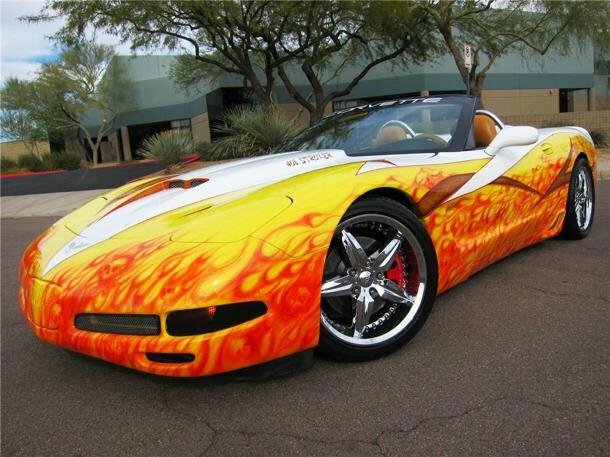 Here's our pick for the most outlandish, starting with a 1998 Corvette with $90,000 invested in a stroked engine, nitrous and a paint job that looks like a fiery rash. For more pics and source Click here.